Today I completed the bonus activity for day 1, week 1 of the Summer Learning Journey. 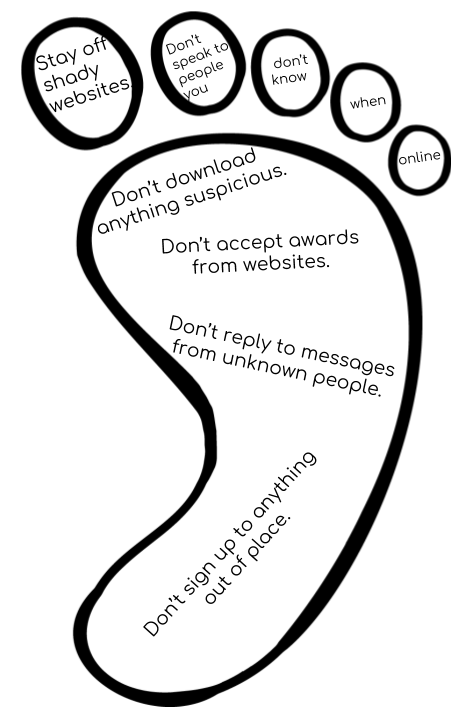 For this activity, you needed to fill in a footprint with different things that you should do to stay safe online. Why a footprint, well this symbolises our digital footprints. This challenge wasn't that hard although it was fun, and got my brain right to work. I like how you made a DlO about digital footprint. I like how you give us tip when we are online. I like how you write don't replay to messages from unknown people. I like the tips you gave us and keep it up Jack. I like how you have some good reason why people should not being doing that. My favorite one was sign up to anything out of place and replying messages that you dont know. I really like how you put all your thinking about being cyber smart into that foot. I also like how you put really good Ideas for others to follow. This means your showing a good leadership to younger students so when they grow older they might be following your rules. For me, my favorite part was Don't reply to unknown peoples messages. I really liked how in your footprint you said things like don't download something suspicious because most people don't know what's good or bad online. Hey there Jack, it's Billy here from the Summer Learning Journey. I've really enjoyed checking out this activity and reading your tips for staying safe online. It's funny how you've put words in the toes too. You've shared lots of different useful tips for staying safe online. I especially like how you have spoken about not downloading things you aren't sure of and also not replying to people you don't know. You need to be careful not to share any personal information such as your last name, home address, school name, etc. Thanks Jack and stay safe online! Hello Jack! It's always important to remember these things when online. I like how you used every part of the digital footprint to make your statements. I think we should always notify a parent about something that happens or for advice. Keep it up!